These should be called "Pumpkin Muffins with Cream Cheese" because as they are, it sounds like they're regular muffins with pumpkin cream cheese. 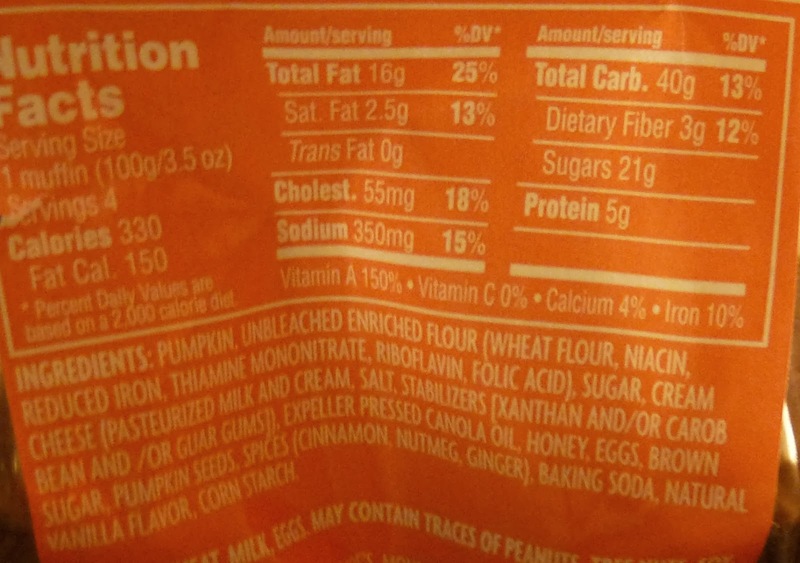 But they're pumpkin muffins with regular cream cheese. Just sayin'. 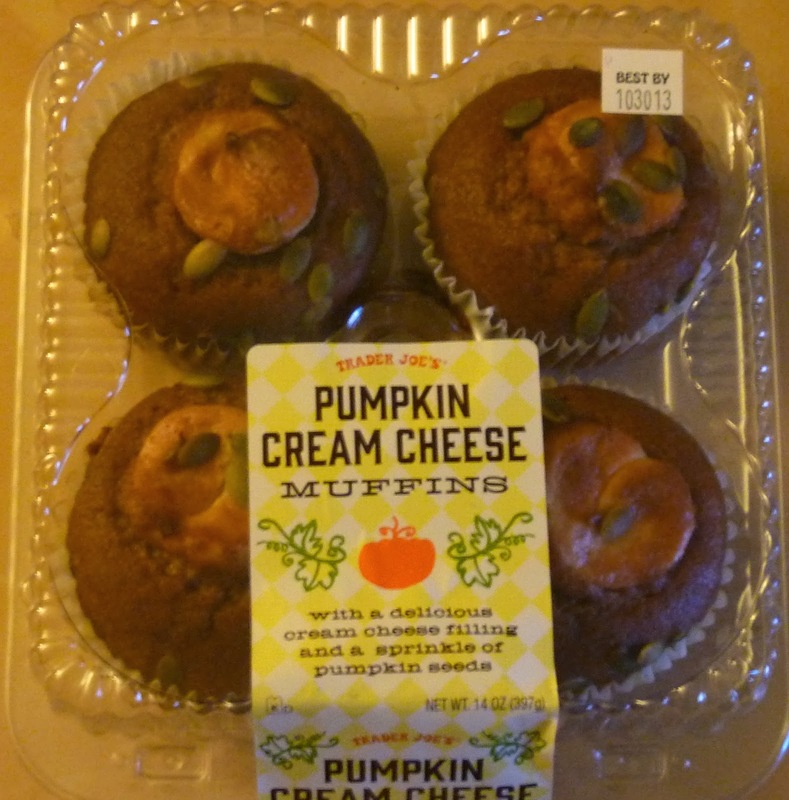 Unlike the recently reviewed Pumpkin Croissants, the pumpkin seeds on these muffins didn't really add much to the product. In fact, I wish they had done away with them altogether. The cream cheese, while pleasantly creamy and rich, was just a single slab right in the middle of the muffin. Sonia kept expressing her desire for more cream cheese. I do agree with that sentiment, but I also must point out that my well-thought-out biting strategy went a long way in preserving the lone dollop of cream cheese until I was nearly done with the bread part of the product. The procedure involved biting straight in from the perimeter of the cupcake and placing the incisors just at the edge of the cream cheese center. In this manner, a proportional amount of cream cheese came with each bite, and there was even a tiny amount left in the core of the muffin which could be coupled with the portion of bread just beneath it. This method can be improvised, but for greater accuracy, you might want to employ the use of a compass and protractor. I would draw a diagram for you, but alas, I am not as talented as my cross-state blogging comrade when it comes to MS Paint illustrations. I personally liked the bread quite a bit. It was moist and slightly pumpkintastic. I would have eaten it sans a heavy topping, but Sonia insisted that it required cream cheese or frosting to be palatable. 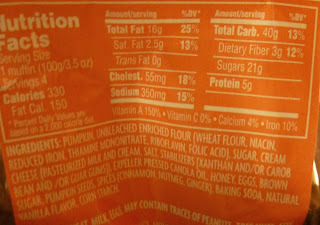 That's unusual, since I'm normally the one pining for more sugar and fat. All in all, I think these make a happily-autumnal snack or dessert. If moist pumpkin bread sounds good to you, check 'em out. Just don't expect a whole lot of cream cheese. Sonia gives them 3 stars. I give 'em 3.5. OH MAH GAH I think I need more coffee. I had to read that first paragraph 4 times to get it and I think my eyes crossed a little. LOL ok I get it now. Now I can read the rest of the review.